On Wednesday, Gerber announced it had appointed its first “spokesbaby” with Down syndrome. Some saw the appointment as hypocritical, as the baby food company’s sister company Gerber Life reportedly denies some children with Down syndrome insurance coverage. Iconic baby food brand Gerber has appointed its first “spokesbaby” with Down syndrome. But, according to some parents of children with Down syndrome, the move is a hypocritical PR ploy. Gerber announced that Lucas Warren, a one-year-old from Dalton, Georgia, had won the company’s Gerber baby contest on Wednesday. Warren, who has Down syndrome, was chosen from more than 140,000 applicants. “Every year, we choose the baby who best exemplifies Gerber’s longstanding heritage of recognising that every baby is a Gerber baby,” Bill Partyka, CEO and president of Gerber, told TODAY. Many people took to social media to celebrate the decision. But, others saw the appointment of Warren as a hypocritical way for Gerber to publicly celebrate kids with Down syndrome while its sister company, Gerber Life, denied them life insurance. While Gerber Life Insurance is a “financially separate affiliate” of Gerber, the two companies use nearly identical branding and similar marketing. Parents of children with Down syndrome have discussed Gerber Life’s lack of coverage for kids with Down syndrome on various forumsfor years. While Gerber Life reviews applications on a case by case basis, several parents claim that the company either denied their children coverage or told them to reapply when their kids were five. 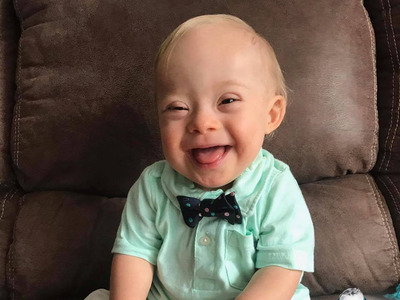 Gerber Life – which, like Gerber, operates under the umbrella of Nestle – told Business Insider that it issues “some policies” that cover children with Down syndrome. “The Gerber Life team issues policies per each child’s unique situation,” a Nestle representative said in an email.